Current Capital IQ consensus stands at Revenue ex TAC of $25.6 bln and GAAP EPS of $4.43. We would note that the $2.7 bln charge from the European Union is included in the GAAP estimate for Q2 earnings. Now that NFLX has smoked their estimates all eyes will be on the rest of the FAANGS. A failure to break above on strong results will raise questions about some of the other FAANGs as they sit on "lofty" valuations. 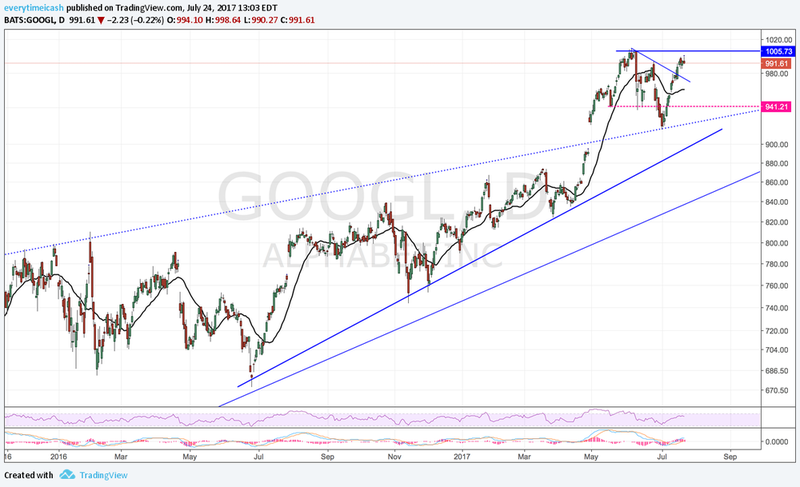 GOOGL however is the one in the group that is trading well below its peers. This will be the second of the group with FB(Wed), AMZN (Thu) and AAPL (Next Tue). There are issues facing the company and that will take on plenty of attention in this earnings report. The company's YouTube ad division is just one of these issues. There has been concern over the past two quarters as some advertisers were pulling spots with the company due to concerns about links to potentially offensive videos. This is expected to be a drag on ad revenue growth in the quarter. Revenue Growth- Investors would like to see this remain over 20%. The primary concern for a miss is centered around the YouTube segment given advertiser concerns in 1H17 over content on the sites where ads are running. Aggregate Clicks Paid- A healthy 44% y/y rate in Q1 which compared to 36% and 33% in Q4 and Q3 respectively. Aggregate Cost per Click- Fell 19% in Q1 and has been seeing double digit declines since Q3. Other Bets- Q1 revenue was $262 mln and the units suffered a cumulative loss of $1.08 bln. Investors are expecting losses to come down slightly in Q2. Shares of GOOGL are hovering below the psychological round $1000 level. $1008.61 Is the post-split all time high. This will be the key level for GOOGL in the after hours.